Where does the artwork you make jewelry with come from? All Unicorn Crafts designs are my own illustrations! How do you make jewlery with Shrinky Dink? Each and every one of my designs start off as a sketch. I then finish up the design in Illustrator and put them on the Shrinky Dink sheets. Each design is then hand cut and baked in the oven. After that, they become one-of-a-kind adorable jewelry that you can wear! Can I sleep or shower with Unicorn Crafts jewelry on? Although our jewelry is water-resistant, it is not waterproof. To enjoy Unicorn Crafts jewelry for a good long while, remove before having contact with water and sleeping. Unicorn Crafts Office Hours are M-F, 10am-5pm PST. Emails are answered during office hours and we try our best to respond within 24 hours. Where are you located? Where do the items ship from? Our items are proudly made and shipped from sunny Northridge, California. Your items will ship within 3-5 business days + shipping time. Please see below for standard shipping times and policies. All sales are final with the exception of returns due to damage, defective product, or wrong item shipped. Claims for missing items or items damaged in transit must be received within 48 hours of receipt of merchandise. The items will be exchanged and/or a replacement sent. Shipping will not be charged for exchanged items as a result of damage, defective product or wrong item shipped. If at any time there is a problem or you are unsatisfied with your purchase, we will work with you to resolve the issue. Our goal is to make every customer happy and your satisfaction is extremely important to us. Am I responsible for customs and duties taxes? Yes. Customers are responsible for any fees, taxes, and duties associated with purchasing & shipping to their respective countries. Absolutely! 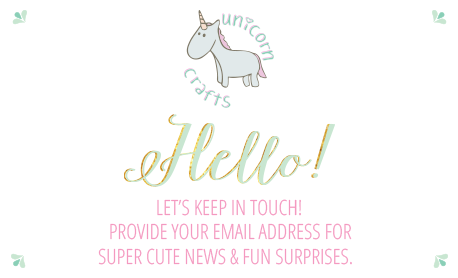 Send us an email at hello@unicorncraftsart.com to get started.